As a North Bay trucker stops for a red light on Hwy.11, a blonde catches up. She jumps out of her car, runs up to his truck, and knocks on the door. The trucker lowers the window, and she says, "Hi, myname is Heather, and you are losing some of your load!" The trucker ignores her and proceeds down the street. When the truck stops for another red light, the girl catches up again. She jumps out of her car runs up and knocks on the door. Again, the trucker lowers the window. As if they've never spoken, the blonde says brightly, "Hi, my name is Heather, and you are losing some of your load!" Shaking his head, the trucker ignores her again and continues down the street. At the third red light, the same thing happens again. All out of breath, the blonde gets out of her car, runs up knocks on the truck door. The trucker lowers the window. Again she says, "Hi, my name is Heather, and you are losing some of your load!" 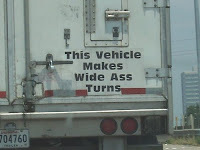 When the light turns green the trucker revs up and races to the next light. When he stops this time, he hurriedly gets out of the truck, and runs back to the blonde. He knocks on her window, and as she lowers it, he says,............ "Hi, my name is Kevin, it's winter in CANADA , and I'm driving the bloody SALT TRUCK......."